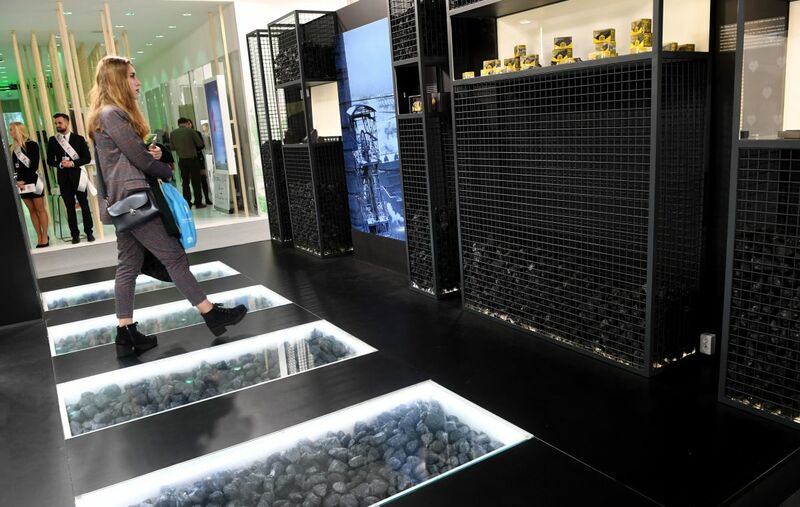 Coal on display at the Polish pavilion during COP24 in Katowice, Poland, on December 3rd, 2018. On Wednesday at the United Nations global climate summit, Poland launched a new declaration drawing attention to the important role of forests in achieving the goals of the Paris Agreement. 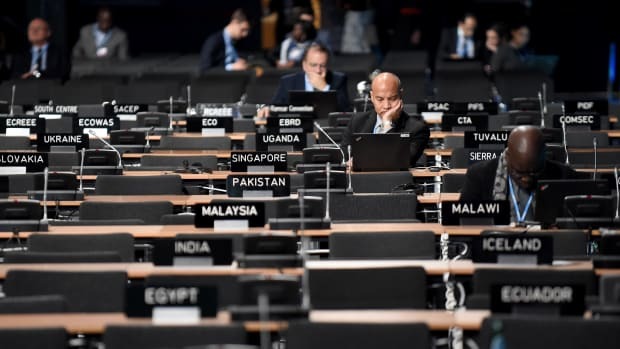 At the contentious negotiations, a declaration on forest protections might seem like a welcome announcement—but the declaration, known as the Ministerial Katowice Declaration on Forests for the Climate, has become a controversial document. 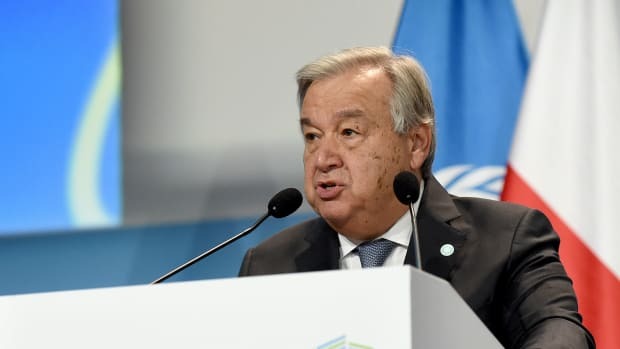 The declaration calls on countries to "take action to conserve and enhance sinks and reservoirs of greenhouse gases, including forests," before mid-century, while urging scientists to study the role of forests in "achieving a balance between anthropogenic emissions" and carbon sinks. "It&apos;s valuable for the parties to reinvigorate the political commitment to natural climate solutions," says Peter Graham, managing director of policy and research at Climate Advisors, an environmental policy consultancy group. Graham notes that less than 2 percent of climate finance currently goes toward forest and land sector solutions. "The science is clear: We can&apos;t reach less than 2 degrees without, quite frankly, radically increasing the attention paid to the sector." 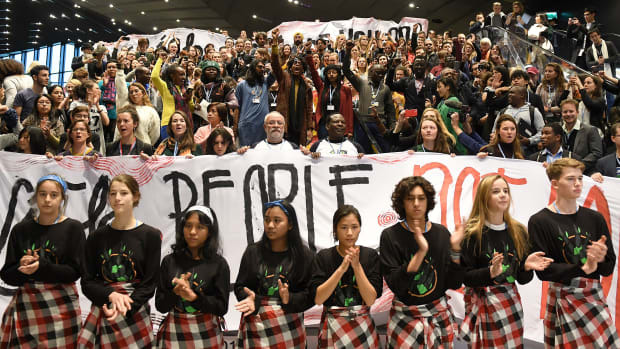 But while members of civil society praised the document Wednesday night for including references to biodiversity and indigenous communities, they say the language of the declaration suggests that Poland, a coal-dependent country, is seeking to use carbon offsets in its forests to delay real efforts to reduce its emissions. Peter Riggs, of the non-profit Pivot Point, said that the declaration "flirts with a false solution and with a dangerous misconception about the land-use sector." That false solution, according to Riggs, is the concept of using forests for bioenergy, which can ultimately be worse for the environment than even fossil fuels. For one thing, biomass for fuels takes up valuable land, which could be protected as a carbon sink or used productively for agriculture, for example. For another, burning wood emits large amounts of carbon dioxide—as much as 50 percent of burning coal per unit of energy created, according to FERN, a Dutch non-profit focused on forest issues. "Forests cannot be treated as an offset," Riggs told reporters. "Not conceptually, not as part of the Paris Agreement market mechanisms, and certainly not to excuse continued coal burning, or any other use of fossil fuels." "That&apos;s a valid concern," Graham says. "We need to increase our ambition, not offset our ambition." Poland first floated the idea of using its forests in 2016, at COP22 in Marrakech, Morocco, to buy itself more time to reduce emissions and meet the goals of the Paris Agreement. But that same year, Warsaw announced that it planned to triple the amount of logging allowed in the Białowieża Forest—a UNESCO World Heritage site, one of the last primeval forests in Europe, and home to a group of European bison that are extinct almost everywhere else. The European Commission sued to prevent the increase, and just months ahead of the global climate summit, the Court of Justice found Poland guilty of illegal logging. 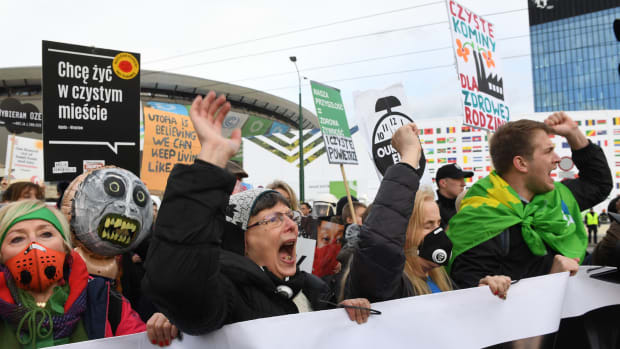 That incident, and the fact that the declaration does not include any guidelines on how to implement its goals of increasing forested areas in the future, led Christoph Thies of Greenpeace Poland to say that he could not take the document seriously. 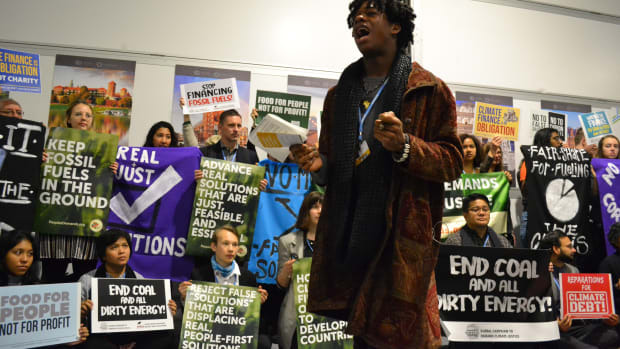 "We can imagine that the Forest Declaration could turn really quickly to be a logging declaration," Thies said, "which would be obviously disastrous for the climate." Virginia Young, with the Australian Rainforest Conservation Society, added that ignoring the effects that logging has on forests&apos; carbon storage capacity is a "major gap" in the declaration. "Primary forests store 30 to 70 percent more carbon than logged forests," she said Wednesday night. Ahead of COP24, Poland began promoting its Forest Carbon Farm project, a State Forest-run program launched in 2017 with three main goals: afforestation, protecting existing carbon sinks, and planting trees for bioenergy. "Thanks to the conception of forest carbon farms, we can achieve the climate neutrality called for by the Paris Agreement," Jan Szyszko, Poland&apos;s former minister of the environment, said earlier this year. "Europe and the world should take interest in this project." In total, Poland claims that the project could sequester an additional one million metric tons of carbon dioxide over 30 years—about as much as is emitted by 215,000 cars over the course of a year—or, as Thies put it in a press conference on Wednesday, 10 days&apos; worth of emissions from the Polish Belchatów Power Station.